UK art market; most probably the item has been in the UK since colonial times. 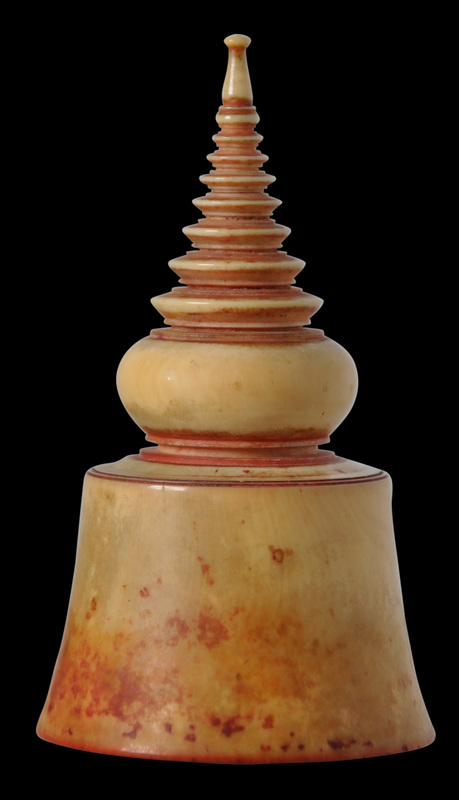 This fine seal has been turned and carved from a single piece of ivory and is in the form of a stupa or chedi. 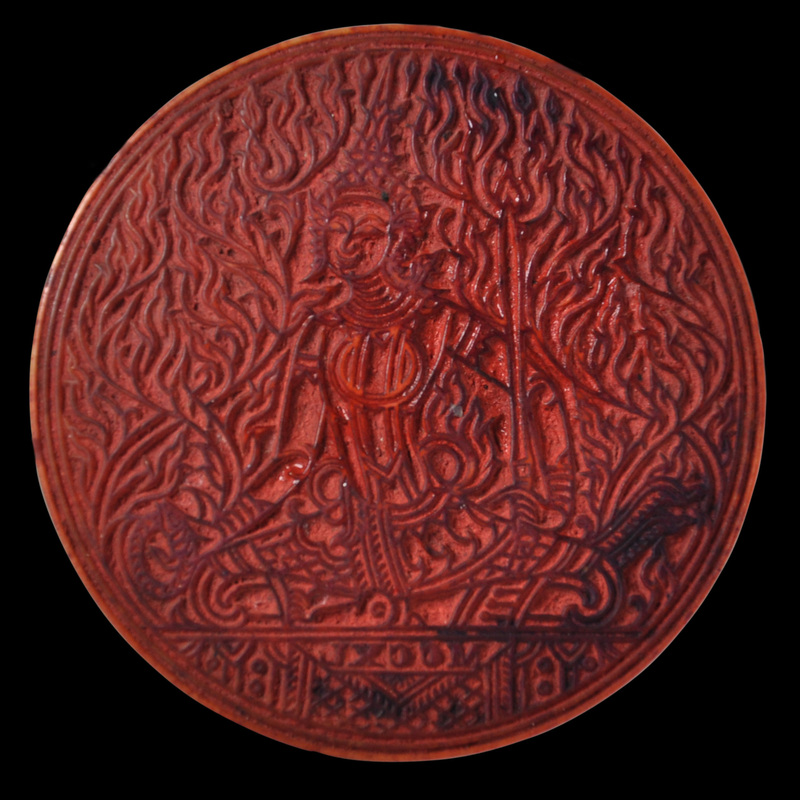 It is an example of a known series of seals used in the nineteenth century by senior Thai officials and senior monks. 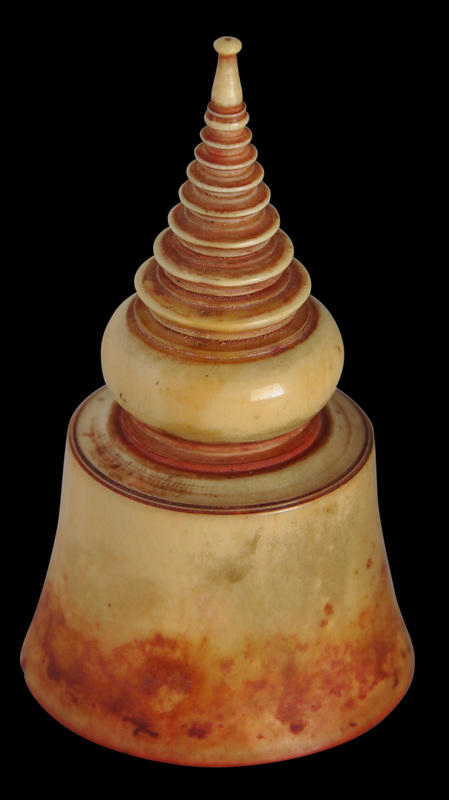 According to Tingley (2003, p. 90), senior monks used such seals to mark sacred texts (sutta) and other items so that they could be identified as belonging to their monastery. They also used them to endorse temple receipts. Officials used such seals in similar ways. The slightly convex base retains ample traces of red seal ink, some of which has also splashed over the lower sides of the body of the seal. The base is carved elaborately and finely with an insignia that incorporates a deity that holds a sword amid myriad, fine Thai-style flaming foliage kranok motifs. The deity sits on a platform beneath which are the letters, curiously in Roman numerals of ‘MCCXL’ (in reverse) which reads as ‘1240’ if using Arabic numbers. Using the Thai chulasakarat year system, this approximates to AD 1878. Several examples from the Doris Duke Collection are in the V&A Museum. Click here to see an example. The example here is in excellent condition. There are no breaks, cracks or repairs; there is only one old and barely discernible nick to the edge of the base. The fine spire of the finial is intact. 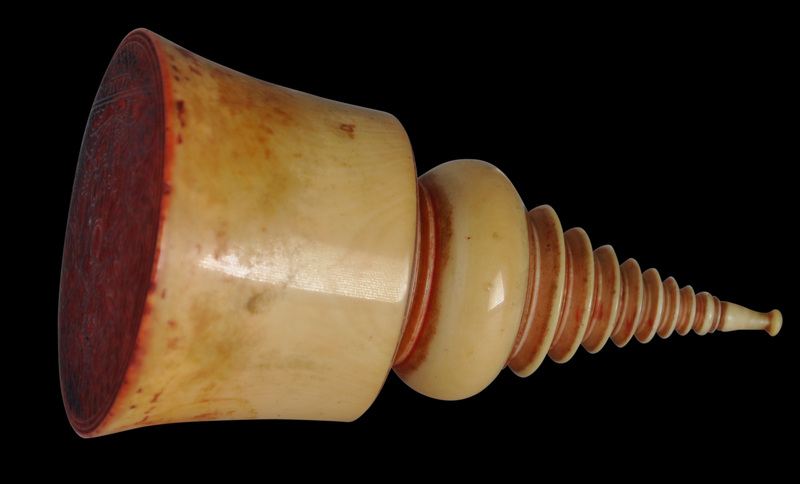 The ivory has a beautiful, golden patina. McGill, F., pers. comm. May, 2016. Songsri Prapatthing (ed. ), Thai Minor Arts, The Fine Arts Department, Thailand, 1993. Tingley, N., Doris Duke: The Southeast Asian Art Collection, The Foundation for Southeast Asian Art and Culture, 2003.